The book offers a comprehensive introduction to the world of Art. It includes over 400 high-quality images illustrating the history of art, its technical applications, and its many uses. It provides a new alternative to traditional textbooks. The essays in this volume develop the models of institutional critique in ways that go well beyond the field of art. The contributors to this volume analyze the past and present of institutional critique and propose lines of future development. This exhibition is devoted entirely to the approximate five centuries of the Old Kingdom. One of its qualities is that it restores our temporal perspective. It demonstrates the extraordinary flowering of the arts at the time the pyramids were built. The Metropolitan Museum of Art's collection of Islamic art is one of the most important and comprehensive in the world. It comprises more than 12,000 works of art created in a vast geographical area, stretching from Spain to India. Numbering almost fourteen thousand objects and spanning the thirteenth through the early nineteenth centuries, the Arms and Armor collection of The Metropolitan Museum of Art is the largest and one of the most encyclopedic of its kind in the world. The challenge for the Metropolitan Museum is to represent this culture by the coherent display of masterpieces that recapture the great moments of China's past. Collections have grown under generations of collectors, curators, and changing fashions. This book embodies my effort to express to students the nature and meaning of art. In writing it, I have sought to maintain scientific accuracy, yet at the same time to preserve freedom of style and something of the inspiration of the subject. These volumes are the first instalment of an undertaking which has for its aim the history and critical analysis of that great organic growth which, beginning with the Pharaohs and ending with the Roman Emperors, forms what is called Antique Art. Messer dissects the elements of modern painting for an uninformed audience by describing basic tenants of modern painting. 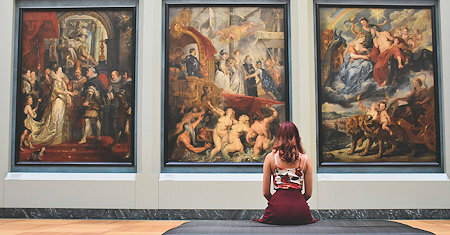 The intended audience consists of museum visitors who find themselves unprepared for the new language of contemporary art. 'Reverence for what is great is a universal feeling...' From the table of contents: Michael Angelo; Leonardo da Vinci; Raphael of Urbino; Titian; Murillo; Rubens; Rembrandt; Sir Joshua Reynolds; Sir Edwin Landseer; Turner. This catalogue is an invaluable resource for scholars of Chinese culture and art. It includes sixteen essays by scholars of Chinese culture, including Wu Hung, Helmut Brinker, James Cahill, Elizabeth Childs-Johnson, Patricia Ebrey, and Sherman Lee. The exhibition inaugurates a new program for the investigation of current tendencies in American and European painting and sculpture. The exhibition also includes a highly selective sampling of younger artists associated with Abstract Expressionism. Selection from the George Costakis collection, an invaluable resource for scholars of art of the avant-garde in Russia. Art historian Rudenstine's introduction describes the Collection's formation and important details from Costakis's biography. The more one knows about the history of painting the greater will be the appreciation of the various excellences which tend to perfection, it is ridiculous to suppose that only the learned are capable of deriving enjoyment from a beautiful picture. This book inquires into the function of all great art, and defines those elements which make for genuine worth. It explains both the basic and superficial differences between ancient and modern art and points out the superiority of the new methods. The life of Michelangelo offers a striking example of the influence that a great man can have on his time. Michelangelo burst like a thunder-storm into the heavy, overcharged sky of Florence. He captured painting, sculpture, architecture and poetry. A sketch of the history of sculpture from the beginnings of civilization to the present day. The author attempted no detailed criticism. A brief description of the materials and methods employed in sculpture is contained in the Introduction. This book is replete with full-color photographs of the contrasting desert landscape, the elaborate tomb, and the paintings. Included are explanations of the hieroglyphs and artwork, plus interesting snippets from Nefertari's culture. Ashton's analysis of modern art grows out of a consideration of Balzac's brilliant and little known 'philosophic' story The Unknown Masterpiece in which the concerns of Cézanne, Picasso, and the abstract expressionists are strikingly prefigured. The rich artistic heritage of sub-Saharan Africa is presented in 40 traditional works. Included are a brief introduction, an explanation of the role of visual expression in Africa, descriptions of the form and function of the works, etc. The lives and works of famous Italian painters: Giotto, Fra Angelico, Fra Filippo Lippi, Sandro Botticelli, Domenico Ghirlandaio, Leonardo da Vinci, Raphael, Michelangelo, Giovanni Bellini, Giorgione, Titian, Tintoretto, Paul Veronese, etc. This book introduces works of art from the superb South and Southeast Asian and Islamic collections of The Metropolitan Museum of Art. Included are examples of Buddhist and Hindu temple art and the later court arts of South Asia. This book was designed not only to introduce a collection of Greek art to teachers and their students, but also to provide them with a general grounding in ancient Greek culture, from the prehistoric period to the end of the Classical age. Examine the principles of geometric design that are the basis for the intricate patterns in the art of the Islamic world. Includes a brief overview of Islamic art, an introduction to related works, and a series of pattern-making activities. The book presents medieval art from western Europe and Byzantium and provides strategies for teaching art of the Middle Ages. Among the contents are an overview of medieval times and art, a discussion of aspects of medieval life, etc. This illustrated resource is designed for teachers of grades K–12 and includes a discussion of the relevance of Rome to the modern world, a short historical overview, and descriptions of 45 works of art from the Museum's collection of Roman art. Comprehensive resource for educators, it includes summaries of ancient Egyptian history and art, lesson plans and classroom activities, and a glossary. The book is aimed at increasing knowledge and pleasure in viewing Egyptian art. Complete and detailed Book discussing Rome and how it evolved through time. Contents: transformation of Rome from a Pagan into a Christian city; Pagan shrines and temples; Christian churches; imperial tombs; Papal tombs; Pagan cemeteries; and more. This textbook provides concise history of painting for class-room use in schools and colleges. It is given a short critical estimate of the individual painter and his rank among the painters of his time rather than the detailed facts of his life.